Beta Lyrae (β Lyrae, abbreviated Beta Lyr, β Lyr) is a multiple star system in the constellation of Lyra. Based on parallax measurements obtained during the Hipparcos mission, it is approximately 960 light-years (290 parsecs) distant from the Sun. It consists of three components: a triple star system (designated Beta Lyrae A) together with two single star companions (Beta Lyrae B and C). These are also the A, B and C components of a wider system designated WDS J18501+3322, which has additional components designated WDS J18501+3322D, E and F. Beta Lyrae A itself consists of an eclipsing binary pair (Beta Lyrae Aa) and a single star (Ab). The binary pair's two components are themselves designated Beta Lyrae Aa1 (also named Sheliak) and Aa2. β Lyrae (Latinised to Beta Lyrae) is the system's Bayer designation, established by Johann Bayer in his Uranometria of 1603. WDS J18501+3322 is a designation in the Washington Double Star Catalog. The designations of the constituents as Beta Lyrae A, B and C, or alternatively WDS J18501+3322A, B and C, and additionally WDS J18501+3322D, E and F, and those of A's components - Beta Lyrae Aa, Aa1, Aa2 and Ab - derive from the convention used by the Washington Multiplicity Catalog (WMC) for multiple star systems, and adopted by the International Astronomical Union (IAU). Beta Lyrae bore the traditional name Sheliak (occasionally Shelyak or Shiliak), derived from the Arabic الشلياق šiliyāq or Al Shilyāk, one of the names of the constellation of Lyra in Islamic astronomy. In 2016, the International Astronomical Union organized a Working Group on Star Names (WGSN) to catalogue and standardize proper names for stars. The WGSN decided to attribute proper names to individual stars rather than entire multiple systems. It approved the name Sheliak for the component Beta Lyrae Aa1 on 21 August 2016 and it is now so included in the List of IAU-approved Star Names. Beta Lyrae Aa is a semidetached binary system made up of a stellar class B7 main sequence primary star and a secondary that is probably also a B-type star. The fainter, less massive star in the system was once the more massive member of the pair, which caused it to evolve away from the main sequence first and become a giant star. Because the pair are in a close orbit, as this star expanded into a giant it filled its Roche lobe and transferred most of its mass over to its companion. The secondary, now more massive star is surrounded by an accretion disk from this mass transfer, with bipolar, jet-like features projecting perpendicular to the disk. This accretion disk blocks humans' view of the secondary star, lowering its apparent luminosity and making it difficult for astronomers to pinpoint what its stellar type is. The amount of mass being transferred between the two stars is about 2 × 10−5 solar masses per year, or the equivalent of the Sun's mass every 50,000 years, which results in an increase in orbital period of about 19 seconds each year. The spectrum of Beta Lyrae shows emission lines produced by the accretion disc. The disc produces around 20% of the brightness of the system. The variable luminosity of this system was discovered in 1784 by the British amateur astronomer John Goodricke. The orbital plane of this system is nearly aligned with the line of sight from the Earth, so the two stars periodically eclipse each other. This causes Beta Lyrae to regularly change its apparent magnitude from +3.2 to +4.4 over an orbital period of 12.9414 days. The two components are so close together that they cannot be resolved with optical telescopes, forming a spectroscopic binary. In 2008, the primary star and the accretion disk of the secondary star were resolved and imaged using the CHARA Array interferometer and the Michigan InfraRed Combiner (MIRC) in the near infrared H band (see video below), allowing the orbital elements to be computed for the first time. In addition to the regular eclipses, the system shows smaller and slower variations in brightness. These are thought to be caused by changes in the accretion disc and are accompanied by variation in the profile and strength of spectral lines, particularly the emission lines. The variations are not regular but have been characterised with a period of 282 days. In addition to the spectroscopic pair, several other companions to Beta Lyrae have been catalogued. β Lyr B, at an angular distance of 45.7", is of spectral type B7 V, has an apparent magnitude of +7.2, and can easily be seen with binoculars. It is about 80 times as luminous as the Sun and is also a spectroscopic binary with a period of 4.348 days. 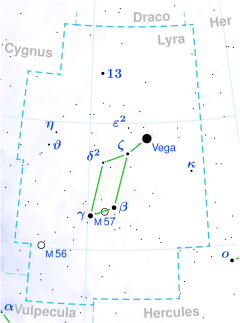 β Lyr C is magnitude 9.9v, separation 86". The Washington Double Star Catalog lists three more faint companions at one to two arc minutes separation. Components B and F are thought to be members of a group of stars around β Lyrae, at approximately the same distance and moving together. The others just happen to be in the same line of sight. Components E and F are both chemically peculiar stars; both are catalogued as Ap stars although component F is sometimes thought to be an Am star. Component C has been observed to vary in brightness by over a magnitude, but the type of variability is not known. ^ a b c d e van Leeuwen, F. (November 2007), "Validation of the new Hipparcos reduction", Astronomy and Astrophysics, 474 (2): 653–664, arXiv:0708.1752, Bibcode:2007A&A...474..653V, doi:10.1051/0004-6361:20078357. ^ a b c d e f Zhao, M.; et al. (September 2008), "First Resolved Images of the Eclipsing and Interacting Binary β Lyrae", The Astrophysical Journal, 684 (2): L95–L98, arXiv:0808.0932, Bibcode:2008ApJ...684L..95Z, doi:10.1086/592146. ^ a b Samus, N. N.; Durlevich, O. V.; et al. (2009). "VizieR Online Data Catalog: General Catalogue of Variable Stars (Samus+ 2007-2013)". VizieR On-line Data Catalog: B/gcvs. Originally Published In: 2009yCat....102025S. 1. Bibcode:2009yCat....102025S. ^ Grzenia, B. J.; Tycner, C.; Jones, C. E.; Rinehart, S. A.; Van Belle, G. T.; Sigut, T. A. A. (2013). "Modeling Circumstellar Disks of B-type Stars with Observations from the Palomar Testbed Interferometer". The Astronomical Journal. 145 (5): 141. Bibcode:2013AJ....145..141G. doi:10.1088/0004-6256/145/5/141. hdl:2060/20130014485. ^ a b Nicolet, B. (1978), "Photoelectric photometric Catalogue of homogeneous measurements in the UBV System", Observatory, Bibcode:1978ppch.book.....N.
^ Wilson, Ralph Elmer (1953), "General catalogue of stellar radial velocities", Washington: 0, Bibcode:1953GCRV..C......0W. ^ Anderson, E.; Francis, Ch. (2012), "XHIP: An extended hipparcos compilation", Astronomy Letters, 38 (5): 331, arXiv:1108.4971, Bibcode:2012AstL...38..331A, doi:10.1134/S1063773712050015. ^ Evans, D. S. (1967). "The Revision of the General Catalogue of Radial Velocities". Determination of Radial Velocities and Their Applications. 30: 57. Bibcode:1967IAUS...30...57E. ^ a b c d Brown, A. G. A.; et al. (Gaia collaboration) (August 2018). "Gaia Data Release 2: Summary of the contents and survey properties". Astronomy & Astrophysics. 616. A1. arXiv:1804.09365. Bibcode:2018A&A...616A...1G. doi:10.1051/0004-6361/201833051. Gaia DR2 record for this source at VizieR. ^ Mennickent, R. E.; et al. (2006), "On the accretion disc and evolutionary stage of β Lyrae", Monthly Notices of the Royal Astronomical Society, 432 (1): 799–809, arXiv:1303.5812, Bibcode:2013MNRAS.432..799M, doi:10.1093/mnras/stt515. ^ a b c "bet Lyr -- Eclipsing binary of beta Lyr type", SIMBAD, Centre de Données astronomiques de Strasbourg, retrieved 2018-07-06. ^ a b "bet Lyr B -- Star", SIMBAD, Centre de Données astronomiques de Strasbourg, retrieved 2018-07-06. ^ a b "bet Lyr C -- Star", SIMBAD, Centre de Données astronomiques de Strasbourg, retrieved 2018-07-06. ^ a b "UCAC3 247-141831 -- Star", SIMBAD, Centre de Données astronomiques de Strasbourg, retrieved 2018-07-06. ^ a b "BD+33 3222 -- Star", SIMBAD, Centre de Données astronomiques de Strasbourg, retrieved 2018-07-06. ^ a b "BD+33 3225 -- Star", SIMBAD, Centre de Données astronomiques de Strasbourg, retrieved 2018-07-06. ^ a b "Naming Stars". IAU.org. Retrieved 18 June 2018. ^ Allen, Richard Hinckley (1899), "Star-names and their meanings", New York: 287, Bibcode:1899sntm.book.....A. ^ IAU Working Group on Star Names (WGSN), International Astronomical Union, retrieved 22 May 2016. ^ "WG Triennial Report (2015-2018) - Star Names" (PDF). p. 5. Retrieved 2018-07-14. ^ Hoskin, M. (1979), "Goodricke, Pigott and the Quest for Variable Stars", Journal for the History of Astronomy, 10: 23–41, Bibcode:1979JHA....10...23H, doi:10.1177/002182867901000103. ^ ten Brummelaar, Theo; et al. (July 2005), "First Results from the CHARA Array. II. A Description of the Instrument", The Astrophysical Journal, 628 (453): 453–465, arXiv:astro-ph/0504082, Bibcode:2005ApJ...628..453T, doi:10.1086/430729. ^ Monnier, John D.; et al. (2006), "Michigan Infrared Combiner (MIRC): commissioning results at the CHARA Array", Proceedings of the SPIE, Advances in Stellar Interferometry, 6268 (62681P): 62681P, Bibcode:2006SPIE.6268E..1PM, doi:10.1117/12.671982. ^ Carrier, F.; Burki, G.; Burnet, M. (2002). "Search for duplicity in periodic variable Be stars". Astronomy and Astrophysics. 385 (2): 488. Bibcode:2002A&A...385..488C. doi:10.1051/0004-6361:20020174. ^ Abt, Helmut A.; Jeffers, Hamilton M.; Gibson, James; Sandage, Allan R. (September 20, 1961). "The Visual Multiple System Containing Beta Lyrae". The Astrophysical Journal. 135: 429. Bibcode:1962ApJ...135..429A. doi:10.1086/147282. ^ Mason, Brian D.; Wycoff, Gary L.; Hartkopf, William I.; Douglass, Geoffrey G.; Worley, Charles E. (2001). "The 2001 US Naval Observatory Double Star CD-ROM. I. The Washington Double Star Catalog". The Astronomical Journal. 122 (6): 3466. Bibcode:2001AJ....122.3466M. doi:10.1086/323920. ^ a b Abt, H. A.; Levy, S. G. (1976). "Visual multiples. III. ADS 11745 (beta Lyrae group)". The Astronomical Journal. 81: 659. Bibcode:1976AJ.....81..659A. ^ Skiff, B. A. (2014). "VizieR Online Data Catalog: Catalogue of Stellar Spectral Classifications (Skiff, 2009-2016)". VizieR On-line Data Catalog. Bibcode:2014yCat....1.2023S. ^ "ADS 11745". SIMBAD. Centre de données astronomiques de Strasbourg. ^ Brown, A. G. A.; et al. (Gaia collaboration) (August 2018). "Gaia Data Release 2: Summary of the contents and survey properties". Astronomy & Astrophysics. 616. A1. arXiv:1804.09365. Bibcode:2018A&A...616A...1G. doi:10.1051/0004-6361/201833051. Gaia DR2 record for this source at VizieR. This page was last edited on 7 April 2019, at 15:54 (UTC).